Wouldn’t it be great if you would wake up fresh and ready for action every morning? We help you do just that, by making the best bedding products we can - natural, sustainable and for a fair price. Why choose Zizzz baby sleeping bags and duvets? We create our duvets and baby sleeping bags around three principles: comfort, breathability and sustainability. To ensure your comfort, we use the softest organic fabrics we can find. We fill our duvets and baby sleeping bags with Swisswool, due to its unique breathability. Finally, we adhere to the most sustainable practices we can because it’s simply the right thing to do. Why is Swisswool ideal for sleep? Why choose a Swisswool baby sleeping bag? Swisswool is a local and sustainable ecological material. The sheep graze in the clean mountain air. The wool is collected directly from farmers in villages in the Swiss Alps. It is then sorted and only the best qualities are transformed into Swisswool for. I am really happy with all the products. They are high quality and it is a delight to sleep in such duvets. I always tell my friends about Zizzz and I will definitely order again. So satisfied, I bought a second one! I bought it for my 3-month-old baby that did not fit in the other brands' bags, which were supposedly designed for his age. I used it despite the heat of this summer and he didn’t sweat like he did with the low price range bags. I’m so satisfied that I bought another one on Black Friday ;) I have used it also for the carseat and the system is good, but it occupies a lot of space and the baby gets a bit grounded in the seat. Easy to install and when we arrive and he’s asleep, I can move him to the nursery without waking him up. The zip is awesome and his neck is perfectly protected… and with a super soft fabric. Don’t hesitate because of the price, cos it lasts forever, not like the other bags whose prices were high for their value. Super product, I’m very happy with it! The idea to use wool was just the beginning - finding the real solution was our challenge. Did a lightweight and washable wool filling for baby sleeping bags even exist? We searched far and wide, but finally found what we needed close to home: a wonderful fibre called Swisswool. 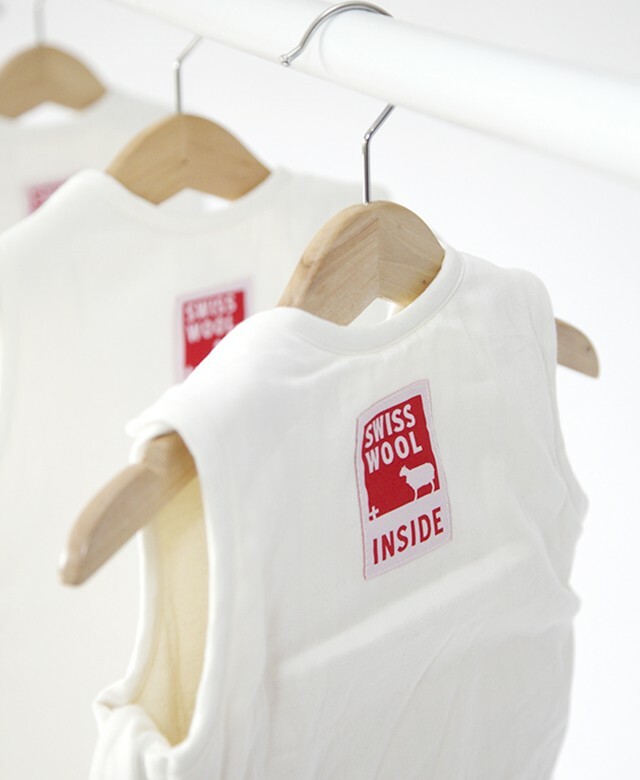 Swisswool is a patented, natural filling material made from 88% virgin Swiss wool and 12% vegetable fibres. It retains all the unique characteristics of wool and is machine-washable. We’re sure your baby will like it as much as ours does. Receive our exclusive special offers in your mailbox regularly. These offers are available only for our community members. Sign up now.